Quality Air Heating and Air Conditioning > Articles > Heating > Why Is This One Room Always Cold? Why Is This One Room Always Cold? During the winter in Columbus, OH, you will depend on your heating system to keep the cold outside where it belongs. If you notice that one room in your house always seems to have that outdoor cold getting inside it, then you may have a problem somewhere in your home that requires attention right away. This issue may not be with your heating system, however: there are other possibilities for the loss of heat in that room that you should investigate. But if you can’t find out the reason on your own, you will need to get the help of experts to solve the problem and pull that room out of the cold. Quality Air Heating and Air Conditioning has put together a list of reasons you may find an icy room in your house that never seems to warm up. Contact us if you need help with this common problem, 24 hours a day, 7 days a week. Blocked/closed vents: If you used a forced-air heater (furnace, heat pump), then it’s possible that the vent into that room is shut or blocked. Moved furniture sometimes accidentally covers the vent openings. Make sure the vents are unobstructed to allow a smooth flow of warm air. Heat leaks: Heat will find any escape to the outdoors possible. If there are windows in the room, check to see that there aren’t cracks around the edges that need caulking. For outside doors, add weather stripping to stop heat leaking. The insulation in the walls may have started to deteriorate (this is especially true if you’ve suffered water damage recently) and will need to be replaced. Thermostat issues: If you have a zone control heating system with multiple thermostats, the thermostat that controls that room may either be set incorrectly or have developed a miscalibration that is preventing it from sensing the room’s correct temperature. If you can’t get the room warmed up by changing the thermostat settings, you may need professionals to fix or replace the thermostat. Incorrectly sized heater: This is a serious problem, since it usually means you need to have a replacement system put in. A heater that is too small for the house it is supposed to warm will struggle to get all the rooms to the desired temperature. If the cold room has always been an issue since your heater’s installation, then this may be the trouble. If you can’t figure out the reason for the cold room, don’t jump to a conclusion and make a drastic decision. Summon HVAC experts to find out what’s wrong. If you need to have professional service for your heating system, or you require advice about any heating problem, get in touch with Quality Air Heating and Air Conditioning. 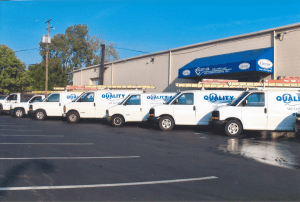 Our technicians are NATE-certified to assure you of quality heating repair in Columbus, OH.